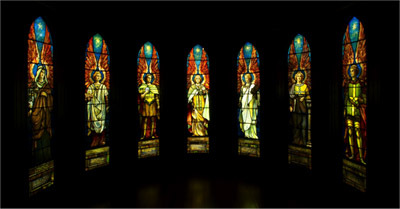 Included here are several sites in the Rochester area that contain Tiffany windows. While all the windows are beautiful and meant to be enjoyed, the Gallery encourages visitors to heed the individual requests below, call ahead when necessary, and use their best judgment when visiting. Please note visiting hours are Monday-Friday, 10:00 am – 8:00 pm. Drop-ins are not encouraged; please call ahead. Office hours are Monday–Friday, 8:30 am – 2:30 pm. Please email Cindy Mark at cmark@thirdpresbyterian.org to schedule a time to visit. Or take the guided tour on Saturday, September 29, 2012. Please call ahead to view the Chapel during the week; larger groups and weekend visits can often be accommodated given advance notice. To learn more about the Chapel, individuals are welcome to call the Community Relations Office of Clifton Springs Hospital & Clinic at 315-462-0141. Above: Photo by Douglas A. Lockhard courtesy In Company with Angels, Inc.